This was our first month as members of the local wine shop’s special wine club, and we had two bottles of beautiful-looking tempranillo calling out to be drunk as a result. I spent a couple of weeks unable to drink wine due to various medications I was on – not fun – but I am finally getting better. So this week, more or less drug-free, I was finally able to taste them. We had one dinner (roast pork and yams) where we opened both bottles and tasted them side-by-side, then planned meals to suit each for the following two nights. 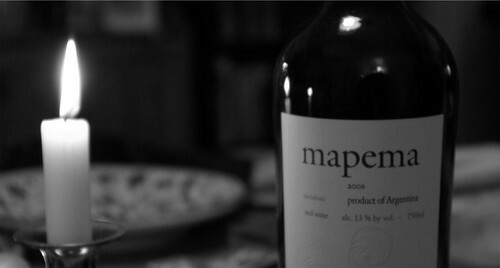 This first bottle, Mapema from Argentina, gave me a strong hankering for romesco sauce – which we happened to have some of in the freezer. One of our favorite dishes from last summer was the grilled shrimp recipe from a 2006 issue of Cook’s Illustrated – we made it over and over again, and were very sad to see it go with the end of grilling season. J wanted to try it with the broiler to see if it could be had in the off season. In the original recipe, the shrimp are grilled until partially cooked, then finished in a warm sauce, so we figured it should adapt fine. It worked fairly well, although we’re not as handy with our broiler as we are with the grill – there wasn’t much noticeable char. 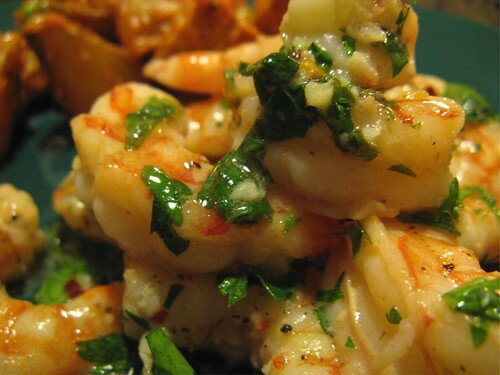 The shrimp were delicious, though, in their sauce of lemon juice, garlic and parsley. I think next time we’ll just cook them on the stovetop and save the grilling for summer. For the potatoes, I made it up as I went along. We had some nice but slightly salty romesco sauce left over from a Gretchens class last September, so all I did was chunk some yellow potatoes up and rub them with a little olive oil, then roast them in a cast iron skillet until they were crispy on the outside. 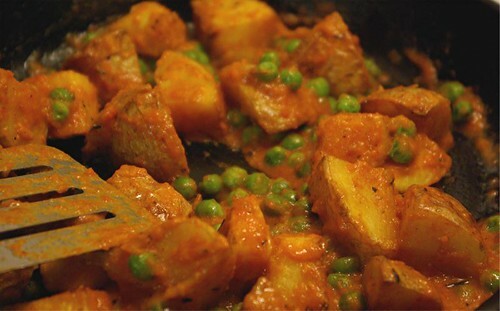 Then, on the stovetop, I dumped the romesco over, along with some frozen peas, and heated it all through. The potatoes lost their crispiness, of course, but the end result was really tasty. 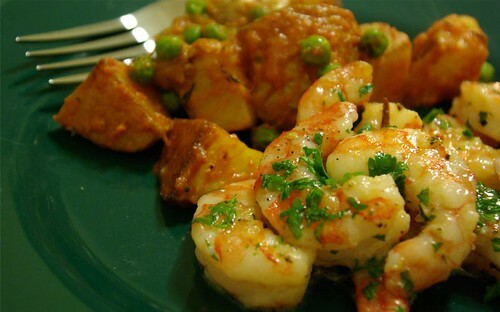 And I was right, by the way – the wine tasted fabulous with the garlicky shrimp and the peppery potatoes. Perfect. And to go with the other tempranillo, from Spain? I made a pot of mushroom risotto and dropped chunks of kielbasa in it. It was delicious.